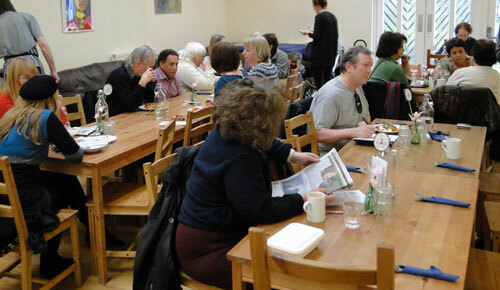 What sort of image does the phrase ‘let’s do lunch in a community centre’ conjure up for you? One Friday The Italian and I decided to put it to the test, we went for lunch at the Station House Community Café in Crouch End. Soup kitchen it ain’t. It’s a lovely, light airy place with a warm atmosphere. Wooden tables were laid out with cutlery wrapped in napkins. There was no need to queue at the counter for our food because we were sat at our table and then a friendly young lady came to take our order. OK, but what was the food like? Well, it was all food that was about to be thrown away. The community café at Station House is run by volunteers from the organisation Food Cycle. They collect food that the local supermarkets donate, food close to its sell-by date that would otherwise be thrown away. (Every year 400,000 tons of perfectly edible and nutritious food gets dumped by UK supermarkets.) They turn it into really tasty and extraordinarily good value meals. And they’re doing a brilliant job. 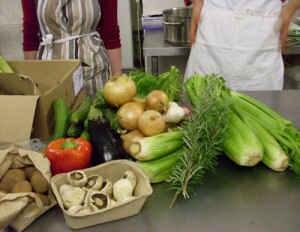 The menu changes frequently, it all depends on what food has been donated. But there’s usually a choice of starters, a main course and a choice of desserts. We were told there’s often something involving bananas; apparently a lot of bananas get donated. On the day we went we could have had either the broccoli and blue cheese soup or the onion soup to start – they were just one pound each. 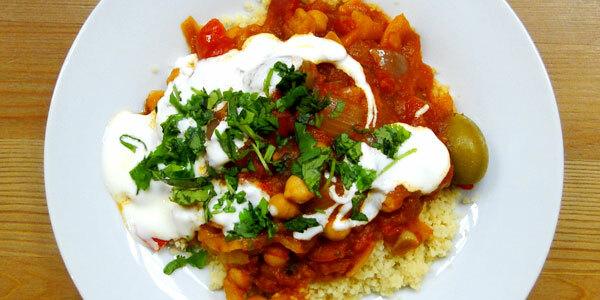 The Italian had been to the dentist that morning so he missed out and watched me eat my main course, a delicious tagine of red peppers topped with yoghurt and chopped fresh coriander – just £2.50. For dessert there was a fresh fruit salad, apple and cinnamon cake or caramelised banana cake – all just one pound each. Or you can have three courses and a cup of tea or coffee for just four quid. What a superb meal deal. We took some of the cake away with us, the apple and cinnamon cake was spicy and moist and would have given my mum’s a run for its money, believe me, that’s praise indeed. I’ve no doubt we’ll be going back. The idea is proving popular, about 80 or 90 people from all walks of life turn up every Friday lunchtime. (It’s only open on Fridays.) So get along there, not only will you be getting a really good lunch, (probably the best value lunch in town), you’ll also be supporting a cause that’s doing something positive about the staggering amount of food waste in this country. Open every Friday from noon until 2.30pm. The idea behind FoodCycle is simple. Food retailers throw out millions of tons of edible food every year due to supply overstock. FoodCycle’s aim is to redirect this food so it can be used to cook nutritious meals for people in the local community who do not have access to healthy foods for a variety of reasons, such as lack of income or knowledge of healthy nutrition. That said, anyone and everyone are welcome.